Yagyas do not always end happily in the Mahabharata. I wrote about two such sacrifices earlier, both performed by Yudhishthira. 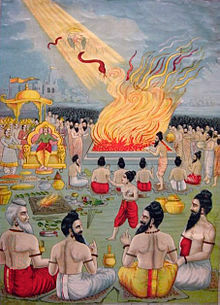 The most famous was the first one - the Rajsuya Yagya. It ended with the death of Shishupala at the hands of Krishna, and initiated a series of events that culminated finally with the eighteen-day war on the battlefield at Kurukshetra. My favourite however is the Sarpa Satra. This was the sacrifice initiated by Janamejaya to avenge his father's death, who had been bitten to death by Takshaka. The sacrifice was to ensure the destruction of all snakes. The sacrifice started, but did not complete. It was halted, at the instructions of Janamejaya himself! What followed thereafter was the first public retelling of the tale of the sons of Krishna Dvapayana. So who were batting - so to say - for the sacrifice to be successful? Second, Brahma who heard the curse, was distressed, but did nothing. Why? Because the snakes were poisonous, possessed "excessive strength", "were mighty in prowess", and had a "tendency to bite." Brahma saw in the curse a way to lessen the growing numbers of these snakes. Let's not forget the role of Utanka as the chief instigator. Utanka was one of the disciples of Veda (no - not **the** Veda Vyasa). Veda had been one of the three disciples of rishi Ayoda-Dhoumya. While returning from a mission to King Poushya to get his queen's earrings as the dakshina for his guru, Utanka had those earrings stolen by Takshaka. Utanka recovered them after one adventurous venture down into the world of nagas, and thereafter sought revenge against Takshaka. He went to Janamejaya and chided the king for "spending your time in juvenile pursuits". He told him that Takshaka had bitten the king's father, and that he should avenge his death. Thus goaded, Janamejaya asked his ministers of the circumstances surrounding his father's death. His anger aroused, Janamejaya decided on the Sarpa Satra to avenge Parikshit's death! Lastly, but not the least, lest I forget, even before the sacrifice had started, and the platform was being built, a very wise suta had cautioned - "The land on which the platform was constructed and the time at which it was measured indicate that this sacrifice will not be completed. A Brahmana will be the cause." [1.47, Vol I] The suta is therefore an interesting case - do we put him in the group of those wanting the sacrifice to be successful, or in the other group? You decide! What about the other side - those who wanted the sacrifice to fail? This also is as interesting a cast as the previous one. Sarama, the dog of the gods, was ticked off with Janamejaya. More specifically, with his brothers, who had beaten up her son for no apparent reason. She marched up to them and told Janamejaya that "evil will befall you when you least expect it." She had in effect cursed the sacrifice to fail. Then there was Janamejay himself! Why?! Why would he wish for the sacrifice to unsuccessful, when it was he who had initiated it in the first place? Well, that's where the Mahabharata's way of reminding us of unintended consequences comes to the fore. Who did Janamejaya appoint as his priest? Somashrava, the son of Shrutashrava. And what was so special about Somashrava? He had been born to Shrutashrava - his father - in the womb of a snake! This priest would officiate over the Sarpa Satra, which was to kill all snakes! Furthermore, Somashrava had one other weakness - "If a Brahmana asks for anything from him, he always gives it away." [1.3, Vol. I] Later on, it was Janaejaya who granted Astika a boon, and which led to the halt of the sacrifice. The king started. The king stopped. Which brings us to Astika. Astika was the son of Jaratkaru and Jaratkaru. Yes, both father and mother had the same name. That, in fact, had been the condition that Jaratkaru - the father - had laid down for his own marriage. Who was Jaratkaru, the mother? She was the sister of the nagas. Elapatra, one of the snakes, had heard the gods approach Brahma. They wanted to know why he had not stepped in to stop the terrible curse from being placed upon the nagas by Kadru, and if there was any remedy to that curse. Brahma told them that Jaratkaru's son, Astika, would deliver the snakes from Janamejaya's sacrifice. Upon being asked who would be Jaratkaru's wife, Brahma responded it would be one with the same name as Jaratkaru. You can imagine Elapatra and the other snakes' joy on hearing this - they had a sister named Jaratkaru! From that day on, not only did they keep a close eye on Jaratkaru the ascetic, but Vasuki also took great care their sister, Jaratkaru. This was Astika's story then - born to save his family from destruction. Quite unlike Duryodhana - who brought about the destruction of his entire clan! This is very typical of the Mahabharata - there is no simple cause-and-effect. So many events intertwine with each other that every time you read the epic, you are likely to come away with a new insight. Or a story! Note: I have used Dr Bibek Debroy’s Mahabharata, Volume 1, an unabridged English translation of the Critical Edition of the Mahabharata, published by Penguin India in 2010, as my reference. The Sarpa Satra, or the snake sacrifice, is nothing of short of a near-perfect example of a jinxed sacrifice. 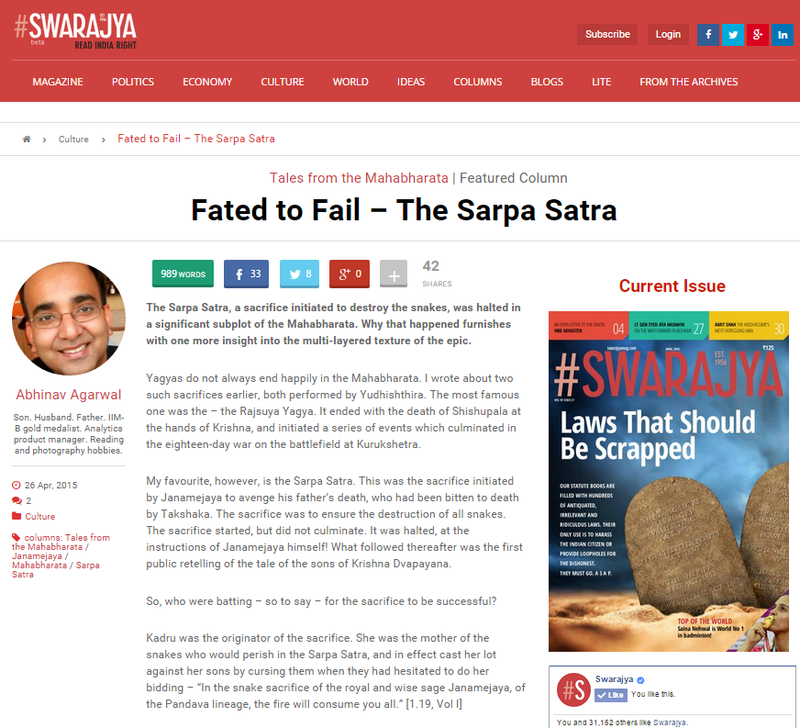 This piece, "Fated to Fail - the Sarpa Satra", first appeared in Swarajya on April 26th, 2015.